This article by Extremely Together young leader Bjorn Ihler of Norway originally appeared in The Independent. I have seen the human beings behind monstrous violence. Khalid Masood is a perfect example. It is often hard to comprehend why a person would choose to kill one person, let alone attempt to kill as many of them as possible. It is far easier to think of extremists as monsters than it is to recognise them as human beings, who play football, have families and tell jokes. Through my own counter-extremism work, with former extremists as well as experts in the field, I have seen the human beings behind monstrous violence. As a survivor of Anders Breivik’s terror attack on Utoya, I needed to find out what made these people tick. Khalid Masood is a perfect example of your “usual” terrorist. Former schoolmates have described him as “a lovely man” and fellow guests at the hotel he stayed in before his attack described him as “articulate” and “polite”. The papers are full of questions about how a popular, sporty, middle class teenager from Kent could grow up to perpetrate such terrible violence. We don’t yet know when Masood was radicalised, but for most extremists this happens when they’re young. A report published in the Journal of International Affairs last year showed that young people join violent extremist groups far more frequently than other age groups, and leaked files have revealed that that average age of an Isis recruit is 26. The vulnerability of millennials to radicalisation isn’t all that surprising. Huge numbers of them feel apathetic at best and alienated at worst by the current political climate. A large part of extremists’ success lies in their ability to oversimplify. They offer simple solutions to complex questions. They offer clear-cut narratives with moral foundations and a higher cause. They offer clarity and a path for those who feel they are treading water, those who feel abandoned and left outside – those we fail. Extremist narratives are able to appeal to vulnerable people – those who feel as though their identities are threatened as well as those treated with suspicion for not fitting a traditional “Western identity”. They resonate with people who are looking for belonging, excitement, action and the power to actually do something to address the issues the world faces. These narratives are widely shared online; in the wake of the London attack, Isis is reported to have flooded YouTube with content. Fighters from extremist groups across the globe have taken to Skype, Facebook, WhatsApp, Viber, Instagram, Signal, Telegram and Twitter to recruit both domestic and foreign fighters. They reach out to the millennial generation on their premises and platforms and they respond. If we are to prevent radicalisation, a degree of responsibility does rest on the shoulders of our politicians and media, who capitalise on conflict, fear, oversimplifications and increased tensions – the very same things that extremists seek to exploit. However, countering violent extremism is a generational challenge. Young people are recruiting young people to harm young people, and millennials themselves must lead the efforts to stop them. Extremist narratives that appear absurd still have power over those they influence; arguments that directly contradict them are likely to be dismissed as lies. Counter-narratives need to reshape extremist visions of reality. To do that we have to try to understand the emotional, physical and psychological needs of those to whom the stories appeal. One of the most important things we need is to offer a space for doubt, a space for insecurity, for curiosity, and for failure. We need to celebrate complexity and nuance and understand that it’s OK that things aren’t always clear. We need to be accepting of difference, of the beauty of diversity, and we need to show that we are better than extremists tell us they are by treating each other with dignity and respect regardless of who we are or where we come from. The millennials, all 1.8 billion of us, need to create a new narrative. 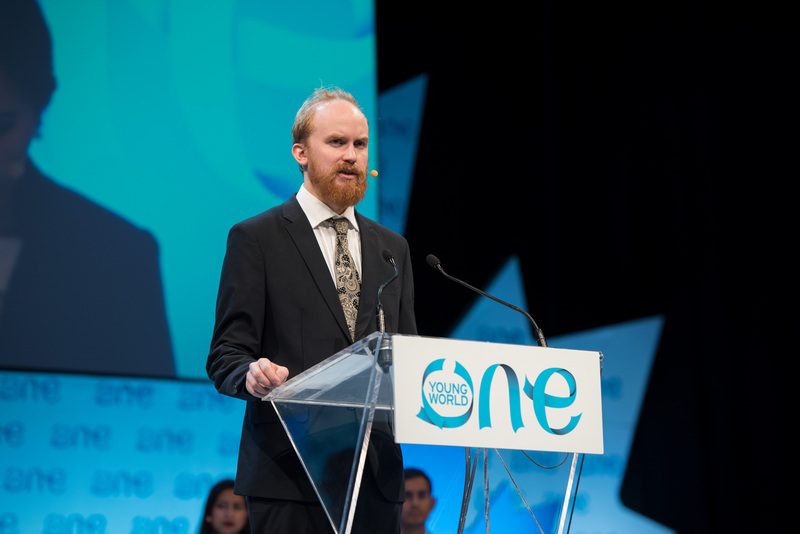 Bjørn Ihler is an academic, activist, technologist and storyteller working to end extremism. He is influenced by his experiences as a survivor of the attack on Utøya in Norway on the 22 July, 2011 and subsequent work with experts and former extremists. He is a One Young World ambassador and a Kofi Annan Foundation Extremely Together Young Leader. In 2016 he co-founded Omelas, a company using technology to challenge extremists.